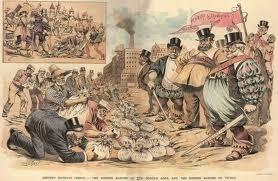 In an important piece in Alternet.org by Erik Loomis titled, "8 Ways America's Headed Back to the Robber-Baron Era," Mr. Loomis notes that "We are recreating the Gilded Age, a period when corporations ruled this nation, buying politicians, using violence against unions and engaging in open corruption." "Over the past 40 years," he states, "corporations and politicians have rolled back many of the gains made by working and middle-class people over the previous century. We have the highest level of income inequality in 90 years, both private and public sector unions are under a concerted attack, and federal and state governments intend to cut deficits by slashing services to the poor." "We are recreating the Gilded Age, the period of the late 19th and early 20th centuries when corporations ruled this nation, buying politicians, using violence against unions, and engaging in open corruption. 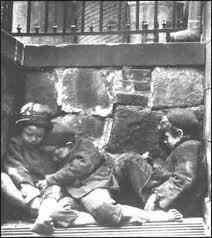 During the Gilded Age, many Americans lived in stark poverty, in crowded tenement housing, without safe workplaces, and lacked any safety net to help lift them out of hard times." The eight ways follow, and we note the conditions back in the Gilded Age - please go to the essay to see how the Conservatives are trying to take us Back To The Future. "In the late 19th century, corrupt railroad capitalists created the Panic of 1873 and Panic of 1893 through lying about their business activities, buying off politicians and siphoning off capital into their own pockets. Railroad corporations set up phony corporations that allowed them to embezzle money from the railroad into their bank accounts. When exposed, the entire economy collapsed as banks failed around the country. The Panic of 1893 lasted five years, created 25% unemployment, and was the worst economic crisis in American history before the Great Depression. 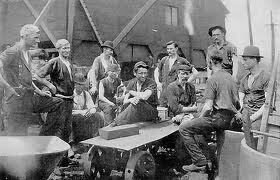 "In the Gilded Age, business used the power of the state to crush labor unions. President Hayes called in the Army to break the Great Railroad Strike of 1877 ; President Cleveland did the same against the Pullman strikers in 1894. "Today, we have the highest levels of income inequality since the 1920s and the gap is widening to late 19th century levels with great speed. In those days, individuals like John D. Rockefeller had more money than the federal government, while the majority of Americans lived in squalor, poverty and disease. "In 1890, copper magnate William Clark paid Montana lawmakers $140,000 to elect him to the U.S. Senate . While most plutocrats did not share Clark’s interest in being politicians, they ensured their lackeys would serve in office, often by offering corporate stock to politicians. Disgusted by this corruption, America in the Progressive Era of the early 20th century created a number of reforms, including the 17th Amendment that created direct elections of senators, as well as a 1912 Montana state law limiting corporate expenditures in politics. 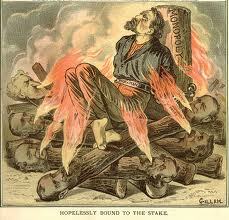 "In the late 19th century, civil and military authorities looked down upon protesting citizens. Widespread violations of civil liberties took place when Americans protested for almost any reasons, whether it was labor unions, political gatherings in Washington, D.C., or African Americans organizing to protect themselves from white supremacists. Police shot strikers and thugs and mobs murdered organizers. 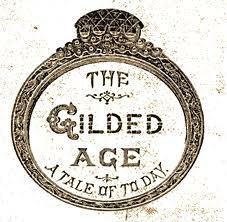 "The Gilded Age saw the rolling back of Reconstruction, with black people unable to vote in the South due to the grandfather clause, poll taxes, literacy tests, and threat of violence. Conservative extremists have chafed at black people voting ever since the civil rights movement ended segregation. "8. Anti-Immigration Fervor"In the Gilded Age, Americans feared the millions of people coming from eastern and southern Europe, the Middle East and Asia to work in the nation’s growing economy. Fearing these immigrants would never assimilate, Americans looked to bar their entry. Beginning with the Chinese Exclusion Act in 1882 and continuing through the Immigration Act of 1924, the country slowly closed its doors to the world’s tired and hungry." Mr. Loomis concludes:"During the Gilded Age, people throughout society began organizing for reform: labor unions, farmers, middle-class reformers. After 1900, this organizing paid off as government began passing reforms to alleviate the most extreme problems of the Gilded Age. Child labor laws, worker compensation for injuries at work, government regulation of the railroads, and the direct election of senators all took power away from corporations and put it back in the hands of the people. 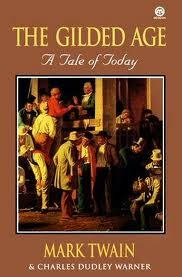 It wasn’t perfect, but it started the social reforms that created the American middle-class. "Like in the late 19th century, we need to take back our country from corporate control. We need to create well-paid jobs in the United States, revitalize the labor movement, and pass legislation to respect civil liberties, give undocumented immigrants legal status, and ensure that voting rights laws are enforced. Like our ancestors, we can fix these problems. First we need to recognize that the 1% has declared war upon the middle class and then we can start organizing to create the better tomorrow we crave." The days of the Gilded Age are frightening enough. 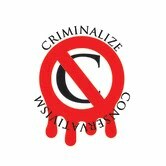 The Conservative leadership will parcel out fiefs to their lords, allowing for example in lieu of nobless oblige, the ability of the lords to interfere in a woman's right to choose what's best for her own body; to compel her to submit to transvaginal ultrasound-vaginal probes at their whim; to kill innocent children for their perceived misbehavior (http://www.arktimes.com/ArkansasBlog/archives/2012/10/08/republican-candidate-fuqua-endorses-death-penalty-for-rebellious-children); and to place our citizens into slavery when needed (http://www.huffingtonpost.com/2012/10/08/loy-mauch-arkansas-slavery_n_1948717.html?1349723890&ncid=edlinkusaolp00000009), just to name a few of the horrors that they have in mind for us. The answer, of course, is to criminalize the pernicious evil called "Conservatism," the criminal conspiracy hiding under the name of a political "philosophy," before it's too late. heart or burn down your house, you can never tell."